Just over a week after returning home from the Ireland rugby tour in South Africa in the summer I found myself heading back to the same continent but for very different reasons. Most of the people on the flight to Tanzania were heading there to climb Mount Kilimanjaro or go on safari. I was travelling with Oxfam Ireland to meet people affected by a crisis that’s totally off the world’s radar. In the past year, over 130,000 people have fled their homes in Burundi because of unrest and crossed into neighbouring Tanzania. It was my first time in this kind of situation and naturally you feel a bit self conscious – a rugby player walking around a refugee camp. You’re aware of how you stand out. The people in the camp were very welcoming, but probably wondering who this bloke was and why he was having his photo taken beside the water pumps and the sanitation facilities! Travelling through the camp, you’re very aware that everybody you see – the adults, the children, even the volunteers working with Oxfam – are refugees. We heard stories of husbands and wives who got separated on the journey to safety, or ended up in different camps hours from each other and unable to reunite. The two camps we visited – Nyarugusu and Nduta in the north west of Tanzania - were different to how I expected. Dry season means red dust was everywhere – and it’s still on my shoes some time later back home in Belfast. There are rows and rows of tents, but there is also shade and vegetation thanks to the trees. Some people have started to plant vegetables near their tents. The trees offer important protection from the sun for the children who study at the camp’s outdoor school. Others are in school buildings and we visited one where the kids seemed to be enjoying school a lot more than I used to! They were full of smiles. You got the sense that going to school was at least providing them with some normality; something familiar, even if just for a few hours each day. Their teachers are also refugees, trying to keep going; knowing that educating these children is key to their future. With a few rugby balls brought from home, I tried to show them what rugby had to offer. It was a fun afternoon, and one brave girl put up her hand to volunteer to try to tackle me. You could almost forget that these children have witnessed harrowing things. In that moment the kids are like any other group of children – laughing, smiling and simply wanting to play. But children have to grow up quickly here, like the five-year-old girl I saw carrying her baby brother, or the boy – no more than a year and a half – fetching water by himself. And that’s when it struck me, he’s the same age as my wee fella Jack, just out picking up water from the tap by himself. That’s the contrast. This time last year the picture of the body of the Syrian child, Alan Kurdi who was aged three, washed up on a beach in Turkey was something that stuck with anybody who saw it. I became a father myself shortly before that so the impact was increased. More recently we’ve been shocked by the photo of an injured five-year-old boy Omran Daqneesh sitting in an ambulance after an airstrike in Aleppo, Syria. It shows you the level of desperation for people coming from countries where they just need to get out of there. We visited a children’s centre, a place where kids can come and play in safety. They were putting on a play about going to the toilet, as part of an Oxfam project to teach children about staying safe and healthy. It was very funny but with a serious message – diseases like cholera are a real threat in crowded camps so the children need to learn about washing their hands. Their parents welcomed us into the humble tents they call home. They smiled too, but there was a sadness there too. I try to picture what it would be like to leave my house and run for my life, and what I would need to do to keep my family safe. One of the refugees I met was Habonimana Christophe*. He’s 31 like me, and is also married and the proud dad of a one-year-old boy called Remy Habonimana. He showed us inside his tent. He opened up to me about his journey from Burundi and why he had to leave. “I was hunted,” he told me. This is actually his second time living the in the Nduta camp. He arrived here as a child in 1993 with his family and lived there until 2008. Habonimana found himself back in the Nduta camp this time with his wife and child in November 2015. Habonimana is really passionate about making things better for everyone living in the camp, and has been voted as a community leader for one of the zones, volunteering his time. He also works with Oxfam as a community hygiene promoter, while his wife has a job in one of the camp’s schools. Both Habonimana and his wife have diplomas in language studies. He was planning on graduating with a degree at university in Burundi before life changed so radically. The life he hoped for has not come to pass. Everything is on hold. “Sometimes I feel bad, like crying, when I think of how I couldn’t complete my education,” he says. Inside his tent are his certificates. Yet he’s focusing on making each day count – and I am in awe of how he and his wife have managed – coming here under pressure and raising a child. That spirit and determination to keep going despite the odds was something I felt throughout the camp. 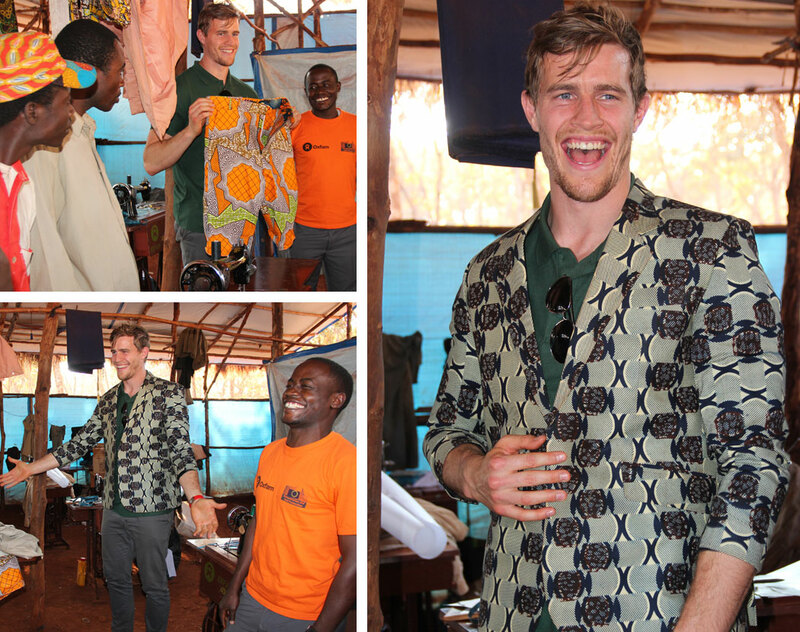 I met a group of men and women who had been tailors in Burundi. They got together in the camp with the idea of starting a business together. Oxfam provided them with machinery, equipment and a building. With the old school Singer sowing machines and fabrics in almost every colour under the sun, they were so passionate about their work. The tailors told me that they are hoping lights can be installed in their workshop so as they can work even longer hours. They hadn’t heard of rugby – but they all knew about football. One of the tailors asked if I was wealthy like David Beckham, perhaps hoping I might be in the market for a wardrobe like his! Listening to how people’s lives changed so utterly because of the war made me think about the choices ahead of me when the time comes to retire from rugby. I’m so fortunate to have options. I can’t imagine what it must be like to be stuck on pause, with no idea of if or when your life will begin again. I’m well used to training for the physical strength and stamina needed for rugby, but that’s surpassed by the mental fortitude and resilience shown by the people I met –people just like you and me, but thrown into an extraordinary situation, not of their own making. People with hopes and dreams just like ours, looking for safety and security for their families and kids, a job, a home, a future. It also made me think about our responsibilities towards helping refugees. The one greeting I heard over and over again wherever we went was ‘karibu’, which means welcome. This attitude towards welcoming strangers helps explain why Tanzania has become a safe haven for refugees fleeing Burundi. It’s incredible to think that this developing country, where there is still widespread poverty, has opened its doors to refugees. This is despite the challenges it faces. During the long journey on dirt roads, I saw children walk barefoot, women walking for miles to fetch water and men pushing bicycles up hills laden with heavy loads. Despite this, Tanzania has welcomed refugees for decades – many of the people I met were actually refugees twice over. You hear it time and again, but it’s truly an eye-opening experience to do a trip like this. When you come back home, you think about everything you take for granted. Simple things, like being able to turn on a tap to get clean water or have electricity and heat at the flick of a switch. Also the freedom to move about, to have a home, to work and to be with your loved ones. 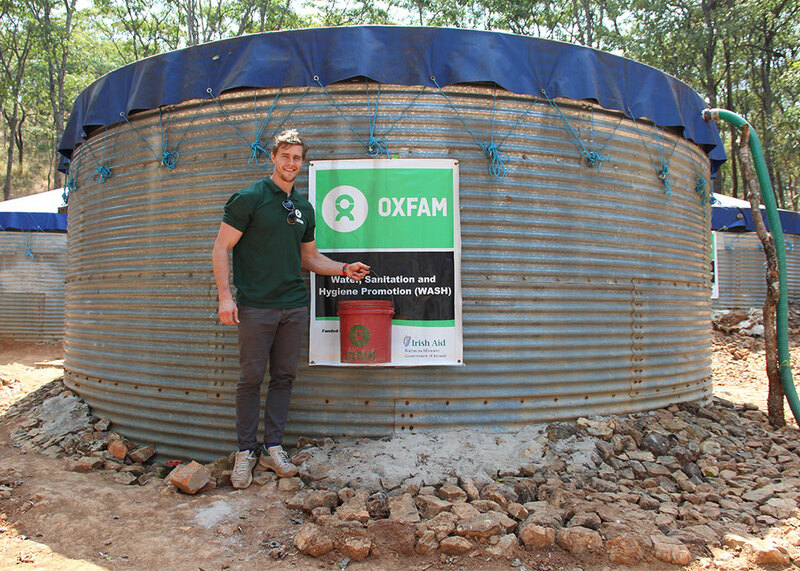 The work I saw by Oxfam is genuinely saving and changing lives. It is a strange feeling to be temporarily planted into a world so alien; to have strangers who have lost everything smile at you and tell their life story, and young children whose futures are so uncertain put on an incredible performance of song and dance to welcome us visitors from Oxfam Ireland. But perhaps the strangest feeling of all was to stand in a place of such sadness and find myself so inspired. 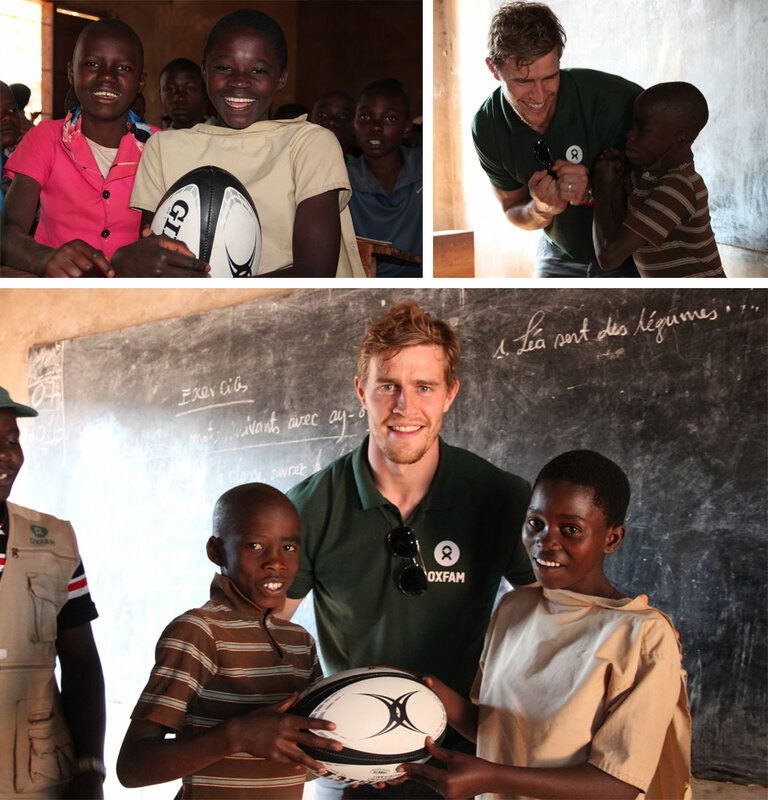 Andrew Trimble is an Oxfam Ireland ambassador.